In this episode: We’ve got some lovely news, lots of epic finds from IRC and Voices from the Masses, all with a smidgen tension. Librem 5, a Security and Privacy Focused Phone. The UK is implementing a new data protection law. Oracle is sunsetting Solaris. mcphail; Helium Rain is shaping up to be a lovely Elite alike, assets have been created in Blender and source is on Github (http://helium-rain.com). ioangogo; and here is another, it’s a collection of projects that implement a open source stack for the zwave protocal, its offical stack is a liceneced closed one (https://github.com/OpenZWave). james_olympus; The BBC has assigned some interesting IP addresses to their public servers. The command getent hosts bbc.co.uk gets you a list of their IPv6 addresses (http://man7.org/linux/man-pages/man1/getent.1.html). mcphail; the new Blender Principled BSDF shader is brilliant (https://youtu.be/4H5W6C_Mbck). JonTheNiceGuy; for two great VPN services you can self host, take a look at wireguard and openconnect (https://www.wireguard.com/). ioangogo; here is a cli util for extracting numbers from a image of 7 segment display (https://github.com/auerswal/ssocr). Outrun, in widescreen at 60FPS. On a Raspberry Pi using CannonBall (http://reassembler.blogspot.co.uk/p/cannonball-open-source-outrun-engine.html). Patchbook, a markup language for modular synth patches (http://spektroaudio.com/blog/2017/8/22/introducing-patchbook-a-markup-language-for-modular-synth-patches). Don’t buy Anirog’s Jump Jet (http://acornelectron.co.uk/mags/au/revs/anirog/Jump_Jet_000.html). Google’s Balkanisation of the web (https://www.rand.org/blog/2012/11/googles-schmidt-decries-balkanizing-of-internet.html). How I replicated an $86 million project in 57 lines of code (https://medium.freecodecamp.org/how-i-replicated-an-86-million-project-in-57-lines-of-code-277031330ee9). Huge thanks to Andreas for The Magit git mode for Emacs and its Kickstarter (https://www.kickstarter.com/projects/1681258897/its-magit-the-magical-git-client). If you would like Mike to read out your neurons next time, email your thoughts to his secretary graham@linuxvoice.com. thank you very much for reading out my neuron. About using org-mode, it’s quite hard to describe what you can do with it since Emacs is so flexible you can tweak it to an insane amount. Btw there’s a plugin called evil-mode which lets you have Vim keybindings in Emacs otherwise I probably wouldn’t be able to use it. The reason why I got interested in org-mode was that I was looking for a good solution for taking notes and tracking ideas. I tried various wikis and other tools but none really worked for me and I don’t want to use something proprietary like Evernote. I can’t really remember where I’ve seen org-mode for the first time but something about it just clicked for me. Since then I’m discovering more and more cool stuff you can do. The feature I currently like the most, is org-babel and tangling. This allows you to write your code in an .org file inside of code blocks and then you can export it to shell scripts, emacs config, python scripts, whatever you need. This allows you for example to write your complete Emacs config inside an .org file which gets converted to a .el file every time you start Emacs (only if you changed something). This makes it really easy to keep things documented. This blog post  is basically just my Emacs config exported to markdown. I started to move a lot of my dot files and bash scripts into a .org file to document and organize them this way. In addition org-mode helps me organize my days, records my working hours and helps me with writing notes on studies. I’ve attached you a few links which I found and still find helpful when I began my journey into this very deep rabbit hole that Emacs/Org-mode are. In addition I added two links to my notes about Emacs however I’m not sure if they are a good read. I use org-mode daily as well. I’ve tried to use other options, e.g. Google Calendar, todo.txt, task warrior, but all of them just fail to deliver the ease of org-mode. With org-mode, you can put deadlines, schedules, todos in multiple files related to each projects, tag them and nicely view them in agenda mode. I cannot really find an alternative. The answer to the Linux market share question is clearly Mr Robot. It’s finally bestowed the OS with mass market cred…. I think that I will give org-mode a go, in the near future, and see how it stacks up against KOrganiser. I’ve got a find that I wanted to share: Videogrep. It’s a Python script that allows you to search videos (with subtitles) for certain words/phrases and mashes them together into one “supercut”. Mr Robot probably also led to an increase in sales of Raspberry Pis. Regarding EMacs and ORG mode, as a happy VIM user I didn’t really consider switching (especially with its crazy key-bindings). 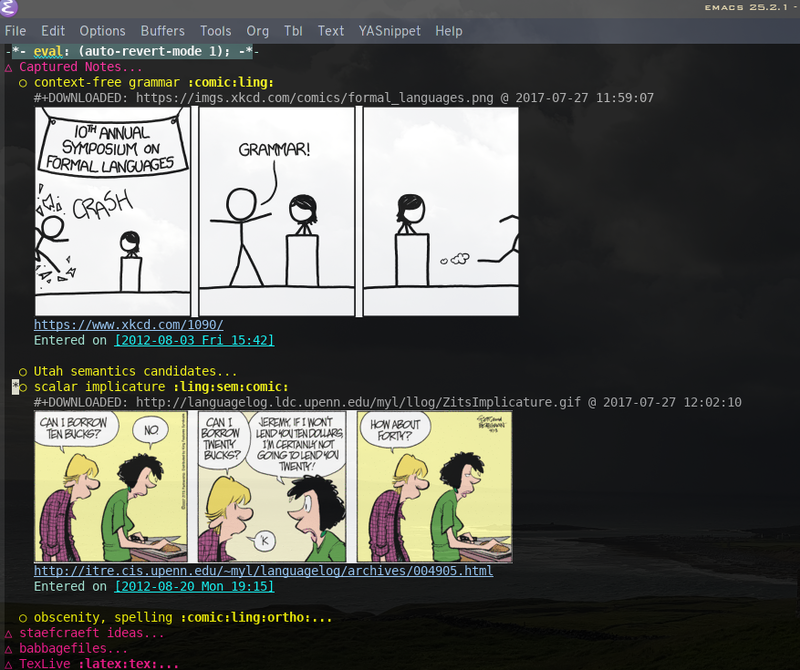 I gave EMacs a serious try… long story short I now have EMacs setup nearly the same as the VIM setup I liked, along with extra functionality EMacs provides. If you use VIM and have zero interest to further configure it extend it, I’m not sure I could recommend EMacs+Evil mode. Otherwise, give it a try. As for org mode, I’ve used it a little, it seems nice but I use task-warrior for task management so its not something I’m likely to move to. Org-mode, like Emacs itself, is a rabbit-hole. There’s so much that can be done with it. I use it for notes of all sorts, but I can also end up entering to-do’s and scheduling meetings inside of my notes, and these will percolate properly into my main to-do list and calendar. One can do time-tracking in it, and then export this in various ways, including producing invoices (which was very useful to me for a one-off consolation thing I did once, where I wanted to accurately track what I was doing and how long each bit took). It was org-mode that convinced me to learn Emacs in the first place. When I realise that it would be a good idea to learn a powerful editor I experimented with both Vim and Emacs (and liked them both! ); but being a fan of David Allen’s GTD system I fell for org-mode hook, line and sinker. As in the above comments it’s impossible to outline everything you can do with org-mode; one of its many advantages is that it’s ‘free-form’ so you can evolve your own personal organisational systems on the fly. However it integrates so perfectly with everything else which Emacs does that I now use org-mode / Emacs for email, web browsing, note taking, file management, address-book/PIM functionality, (it’s also good at editing…!). People often joke on about those of us who seem to ‘live in Emacs’ but for me it seemed to be an unavoidable consequence of starting with org-mode. One final and (for me incredibly important) point is that org-mode is the only way I have found, to date, of syncing all of my task management data across all devices (home/ work / ‘phone) without using the cloud (other people’s servers!). I take a little bit of comfort in the knowledge that I’m keeping my task management data a little more private. > One final and (for me incredibly important) point is that org-mode is the only way I have found, to date, of syncing all of my task management data across all devices (home/ work / ‘phone) without using the cloud (other people’s servers!). Ahh – OK – not the only way then!! Admittedly Syncthing’s a pretty awesome solution for syncing your bits and pieces and I would seriously consider setting this up should any of my projects become any more complex. Up until now I’ve been managing by just whizzing files across to different devices via Bluetooth (I’ve got a portable .exe Emacs on a flash drive for any Windows machines I need to use, including work as I’d never get permission for Syncthing at work….). I do most of my GTD at home (Slackware), and most of my ‘mobile’ GTD using ‘Orgzly’ on Android. It’s only up to 1.5.1 at the moment but I find it much better than mobile-org (the Emacs side of the equation works quite well but the couple of apps out there for the Android side seem to be a bit rough around the edges to say the least). The plus point of Orgzly is that it’s a hierarchical note taker which saves its files in org-mode syntax so it both reads and writes org-mode files – it’s worth a look for org-mode on the go. The down side is that it’s still closed source however the devs seem to appreciate that most org-mode users will be a bit RMS and have promised to open source it in the near future (yes I have punished myself with self-flagellation). Anyway thanks for that – I’ll have a bit play around with Syncthing (and its Android app) and see where that takes me. P.S. I really can’t stand Oreos. I find the best thing for Syncthing is to have it sync only when charging. ‘Orgzly went open source a while back:’ – missed this. I don’t feel guilty now! Syncthing – thanks for the suggestion. I’ve had a brief look at it now and wished I’d tried this sooner. I think I had heard of it before but for some reason didn’t pick up on it. I’ll eat Oreos to punish myself…..
-they’re not inefficient – in the sense that there are obvious ways to save money, they’re inefficient in the sense that any on-call emergency system is inefficient. To give an example, if you need an emergency drug available immediately to hand in a particular place, then you need to keep buying and throwing it away when it reaches it’s expiry date. Yes, it’s waste, but there isn’t a hospital system in the world that is able to reduce waste significantly more than other ones – i.e. hospitals are much the same the world over. -yes why doesn’t whatsapp web, allo web & mighty text web not work with firefox and only chrome? -I used org-mode for a while, it allows you to use the ‘getting things done’ method of organising your life. It was very good – it would collate your ‘next actions’ (i.e. todo’s), and can expand and hide various sections of plain-text files for easier viewing. It can also do way way more – like calendar entries/deadlines etc etc. I’ve gone back to simply using some text files and pluma. Not a particular reason, I probably should try it again – though it does require a bit of investment of time. Also re: Windows/Linux – I dual-booted a machine for my father in law with windows 10 and ubuntu-mate. Have had so many problems with windows 10 (fresh pro install). He uses just ubuntu-mate at the moment. nobody has mentioned org mode tables. they are wonderful. very quick to use, quick to modify. not only are they great for listing table-info, they can also work as spreadsheets. i use the spreadsheet functionality to keep track of some investments. …. you’re not kidding. I’ve just finished having a look and couldn’t stop laughing (out of admiration I hasten to add). Something else to add to the todo list…..
Report on org-mode:- I have got it to perform as a TODO list, but have been too busy to read the documentation. I will do so as soon as I have free time.